We can’t deny that the mobile phone has become central in our lives. Many people can’t stay away from the phone even for a few minutes. Sadly, the obsession with the phone has led to many road accidents and fatalities. According to https://crashstats.nhtsa.dot.gov/Api/Public/ViewPublication/812504 , 3,450 people were killed in 2016 due to being distracted by the phone while driving. They were straining to reach the phone or adjust their sitting position because of the phone being at a lower level. Well, there is a way you can maintain the eye level while glancing at your phone and it comes in the name of a magnetic phone car mount. Distracted driving occurs when you temporarily take your eyes off the road even if it’s for only a few seconds. It happens when you are texting, talking, drinking, fiddling with the radio/stereo, or even eating while driving. Those few seconds may change your life forever since they will delay your response, especially in an emergency. Did you know that taking your eyes off the road for just 5 seconds while the car is driving at 55mph is equivalent to covering a football pitch without looking? To bring the point home, just close your eyes now for five seconds and imagine yourself at that speed. Scary! Sadly many of us do this every day. Any non-driving task you engage it while driving will always increase your chance of getting injured or dying in a road accident. It can be as simple as you tuning the radio, trying to insert a USB in the stereo, receiving a call, sending a text, eating or drinking, or just staring in a different direction. Many people confess that they would be more attentive on the road if the phone was at the same level with their eyes. They would have to bend down to see who is calling or pick the phone. And with the advancement of hands-free calling and Bluetooth technology, you can receive a call without touching the gadget. Phone car mounts are quite effective in minimizing distractions while driving. 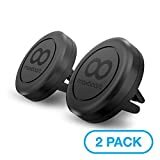 They can be mounted in most cars with ease especially the magnetic ones and allow you to see the phone from a safer level without bending or straining your neck to do so. However, you need to pick the best for quality service. With the rising accidents caused by distracted driving, the UK government has set stiff fines and penalties for in motorist found using their mobile phones while driving. 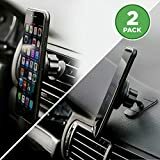 If you want stress free use of the phone or mini tablet while driving then this car mount holder should be making its way inside your car. 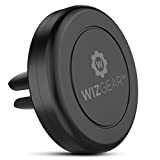 The WizGear universal air vent mount comes with one of the most powerful magnet guaranteeing you of a strong hold on the phone. Chances of it slipping or falling especially while driving on rough roads are unlikely. The unit has been reinforced for extra strength and swivels easily for quick adjustment of the viewing angle. It features a smooth surface for easy holding and also to protect the phone or mini tablet. it‘s suitable for iPhone 6, iPhone 6 plus, and mini-tablets among others. The ZILU Magnetic car mount installs easily in any the air vent and works with most cars. It features strong magnet for powerful attraction and firm hold and a rubber base for preventing slippage or falling. The unit has a ball head construction and rotates 360 degrees for improved viewing while the nice design improves handling. It has two 3M adhesive metal plates that can handle 2 phones and an effective lock that provides extra protection to the phone. Thanks to the versatile nature and effective design, you can operate the unit using one hand. This unit works with iPhone, Samsung Galaxy, MP3 & MP4 players, as well as GPS devices. Boasting of a super strong magnet, this car phone mount will make certain your phone is firmly held tight while you are driving. The unit comes in a simple but very effective design and using it is simple and straightforward. Although lightweight, the unit can handle up to 3kg/6.6 pounds quite comfortably. The smooth surface prevents scratches while the good and sticky 3M adhesive maintains a firm grip on the dashboard. It can be operated using one phone due to its versatile design and can rotate 360 degrees for better viewing. 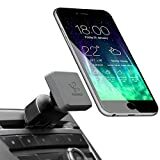 The car mount magnetic holder works with different phones including iPhone X, 8, 8 Plus, Galaxy S8, LG, HTC, and Huawei among others. 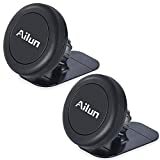 The Ailun magnetic cat mount holder works with Samsung Galaxy S9/S9+, S7/S7 Edge, S6/S6, iPhone X,8/7/6/6s Plus, and other smartphones. It attaches to the dashboard easily thanks to the stick-on design and will ensure the phone remains intact while driving while the smooth backing prevents scratches. It comes in black and looks very stylish to complement the car’s dashboard. Unlike other types of phone mounts, this one doesn’t interfere with the airflow and is also very easy to remove. The cradle-less design improves the convenience while the versatile design also makes it perfect for use in other places. If you own an iPhone X or Android devices then this car mount is perfect. It may look simple in design and functionality but will maintain a firm grip on the device. Credit goes to the strong magnet, good engineering, and sturdy base. It can easily rotate (360 degrees) for improved phone access and stay at the same point for better efficiency. The unit is installed in any CD slot in a short time and stays firm until you chose to remove it, a process that is relatively easy as well. Thanks to the cradle-less design plus the easy snap-in one hand mounting, you won’t struggle to place or removing the phone. This magnetic iPhone holder minimizes the distraction that comes with driving while staring at the phone. It can be mounted on either the dash or air vent and will work well with any of the choices. The thin design easily fits in most air vents and won’t interfere with the operation. The space-saving design ensures the dashboard doesn’t look cluttered. It has strong back magnets that will easily attach to phones like iPhone X/8/7/6/5, LG, Samsung Galaxy S8/S7/S6, Nicoya and many more. The small size and light weight enhances the handling and also won’t exert too much pressure on the air vents or dashboard. 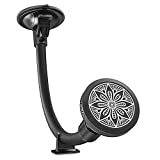 Besides phones, this stylish magnetic mount is also suitable for GPS. This holder comes with a powerful magnet to maintain a solid grip on the phone. It’s crafted from reinforced plastic that will prevent the phone falling especially when driving over rugged or rough surfaces. I love how easily it swivels to provide better views and the easy adjustability. The WizGear universal magnetic mount is mounted in the car’s vent and stays firm thanks to the good engineering. It doesn’t hinder air flow since it has slim points and is based on Swift-Snap technology famed for fast attachment to the phone. You can use it with different phones including iPhone 6, 6plus as well as mini tablets. I love the strong rubber base for its solid hold and minimal vibration. The mount is attached to the windscreens using suction cups or adhesive. This location is preferred for its convenience since the driver will always be looking through the windshield. It’s also an easy installation and maintenance is cheap too. When not needed, the accessory can easily be removed and won’t leave any marks or damage the glass’s interior surface. This is also another popular fitting location and allows you to keep your eyes glued to the road. It is chosen over the windshield because it doesn’t interfere with the view and is also easy to use. However, the view will be a little lower than that from the windshield. The attachment is normally via an adhesive which attaches firmly but won’t spoil the dashboard’s covering. Some drivers prefer sticking it in the rearview mirror and just like the mirror installed, the distraction is minimal. It’s easy to attach, doesn’t affect front visibility, and adjusting the angle is easy. The mounting design is also versatile as it gives the driver more viewing options. Some users, however, say the angle is little high especially for short people. The vent is also another good location. Pick the center vents which are normally located in the upper region of the dashboard. The fitting design will be influenced by the type of dent or mount as well as the spaces or opening. While it works okay, some people say it inhibits the flow of air into the car. Before purchasing a product, you may opt to try different locations and angles so as to determine which one works best for you. You can view this video https://www.youtube.com/watch?v=gXhjxDIkHsk to learn important tips about the accessory and also the best places for fitting. I know that the phone is part-and-parcel of life and many people are kind of addicted to it. However, you don’t have to put your life or that of other car occupants or motorist at risk because you were straining to see who is calling or texting you. Simply acquire a magnetic phone mount to hold the phone at the right and safe level. We have picked the best that will definitely improve the driving even when staring at your phone. Don’t let “LOL” “SMH” LMAO be your last texts or Oh my Gosh be the last words you remember before an accident. Invest in the best magnetic phone car mount for safe and convenient driving.